Life with Liv: My baby is starting nursery! Matalan back to school range - review. My baby is starting nursery! 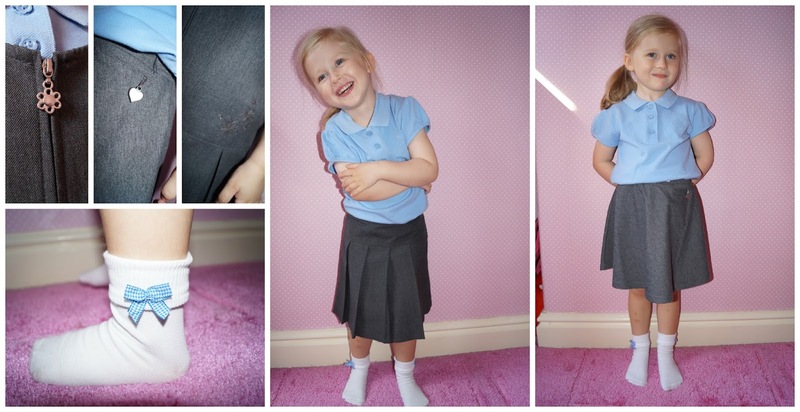 Matalan back to school range - review. Unbelievably, Liv starts Nursery in September. I honestly don't know where the time has gone! 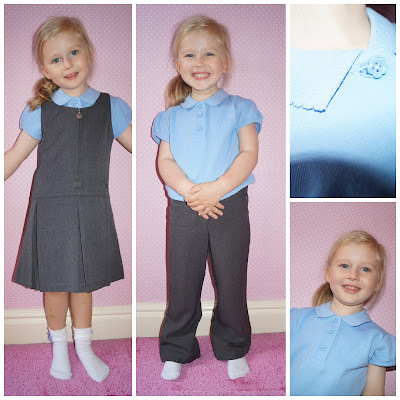 It all seemed quite a way away yet until the lovely Matalan team kindly got in touch and asked if we would like to review some school uniform. Then reality hit! I readily agreed and was given a £50 budget to spend in the back to school shop. I had no idea how much uniform costs or how far this budget would go but I was very pleasantly surprised! The colour scheme for the uniform at the school Liv is attending is grey skirt/trousers and light blue blouse/polo shirt, with this in mind I began shopping. There was a huge choice available in a wide range of sizes and colours so I had no problem finding possibilities, the only problem was narrowing my choices down! 6 x school socks - £3 for 3 pairs. Liv is very big for her age, usually wearing clothes 3 years older than she is, so I used the handy Matalans measuring guide to determine her size rather than going for her age group. Not only is the price brilliant but the quality is fantastic too. My Mum used to be a seamstress so I have been well trained to test seams, check stitching and make sure buttons are secure - all of which were spot on with all of the items I received. Polo shirts - have a lovely scalloped collar, flower shaped buttons, pretty cap sleeves and some embroidered flowers on the chest. Pinafore - has a lovely flower shape for the zip toggle, flowers embroidered on the left hip area and it is coated with a Teflon stain resistant coating to repel water and stains. Trousers - have a fully adjustable inner waistband to help make sure you get full use even during growth spurts! Pleated skirts (pack of 2) - have an elasticated waist to the back and are also treated with a Teflon stain resistant coating. Jersey skirt - elasticated waistband and heart charm. The socks - are a lovely finishing touch to the uniform with either a frill or gingham bow in the corresponding school colours. They come in packs of 3 and are also available in yellow, purple, green, and red. I am very happy with the items we chose, I have put them all through the washing machine and they have all retained their shape and the pleats are still in place. I would definitely recommend Matalans back to School Range to Family and Friends. Disclaimer - we were provided with the School Uniform for the purpose of the review, however all opinions are honest and our own. Images subject to copyright.